At a first glance, I could have sworn I was staring at the photo of a manequin. It looks so out of this universe, but I love it. The contrast between the lips and her face; the bangs; the scarf tied around the head has, strangely enough, no reminiscence of the D&G Fall 08 collection. Dare I say she is slightly attempting a bit of some gothic influences, but oh, doesn't she pull them off well! Her name is (Viktoria) Vika Gazinskaya and she is a Russian designer. When I read this, I immediately googled her. Her designs have that sobriety in them which she seems to incorporate into her outfit too. But it's graceful at the same time. 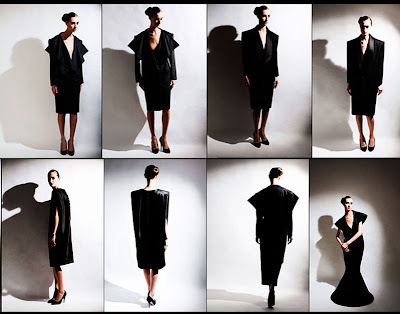 Straight lines, mainly relying on the materials in the garments to do the talking. I'm not so much into her current collection, but feel rather attracted to her SS 08 instead. Mind you, it's all about light colors, structured pastels. I'd wear it in winter if the materials would be appropriate. Here she is wearing a white coat from her FW 07 collection. I love its minimalism, it somehow reminds me of the cut in the Balenciaga coats, circa FW06. Well, I sure can tell she knows how to be a style chameleon. She seems to be quite the master when it comes to changing her look radically. But whatever she decides to go for, she can be easily recognised by her fair complexion. It's amazing what contrast it can give next to her straight hair.